Even before soul singer Sharon Jones’ triumph over cancer, her story was one of the most inspiring tales in modern popular music. First, it’s the story of talent and determination overcoming show-biz shallowness. When she auditioned for Sony Records back in the 1980s, some cretinous executive rejected her, telling the young singer she was too black, too fat, too short, and too old. That was a setback for certain. She had to work at a series of day jobs — including as a corrections officer at Rikers Island — before she began her recording career. Jones was in her forties when she released her first album, in 2002, on the musician-owned Daptone Records. The fact that she built a respectable career with millions of fans and critically acclaimed work — without the help of a major record label or commercial radio — is heartening in itself. 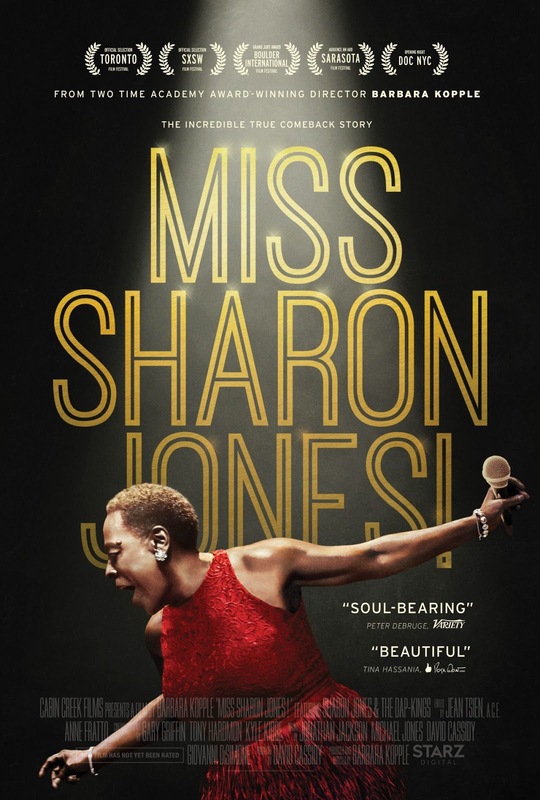 So it’s only logical that Jones’ battle against cancer would also be an inspirational story — and that’s the main focus of Barbara Kopple’s documentary Miss Sharon Jones! In 2013, Jones was diagnosed with pancreatic cancer. This was before the release of her album Give the People What They Want. After a brief montage of music clips and biographical narrative, one of the first scenes of the documentary shows Jones in a barber shop getting her head shaved. After that, she tries on various wigs — one, she jokes, makes her look like Tina Turner, another like Oprah. But that’s about the last time we see her in a wig. During her chemo treatments, she prefers to be defiantly bald. Not surprisingly, this movie is not always pleasant. We see Jones at her highs — like when she finds out she’s booked for an appearance on Ellen, one of her favorite TV talk shows. And we see her lows, such as the scene where she lashes out at her band, the Dap-Kings, because their Thanksgiving dinner was canceled. One of the most moving scenes is an interview in which Jones, full of shame, talks about a low point when she wrongfully accused her loyal, longtime manager Alex Kadvan of being more worried about the money the band was losing than about her health. But the truth is that Jones’ cancer was a huge financial strain on the Dap-Kings and others who work with her — all of whom depend on performing with Jones to make a living. For starters, the band’s tour was canceled the summer she was diagnosed. Dap-King guitarist Binky Griptite tells how the news of Jones’ condition came right after he and his wife decided to split. All at once he realized he was “divorced, laid off, and my friend had cancer.” And bassist Gabe Roth tells how a couple of banks balked at refinancing his home after they read about Jones’ illness. After viewing Miss Sharon Jones! the first time, my initial criticism was that Kopple spends too much time in Jones’ chemo clinics and not enough time at concert halls. My knee-jerk reaction as a fan of her music was that I’d much rather watch two hours of Jones and her band doing what they do best, proving that good old-fashioned funk and soul never die, no matter what the musical industrial complex is trying to sell you at the moment. But watching the documentary a second time softened that reaction somewhat. While I’d still like to have more music in the film, I realized that seeing the energetic, confident Jones at these moments of weakness, exhaustion, and frustration is important in understanding the singer. Kopple intersperses bits of Jones’ biography into the film. We hear Roth talk about how back in the ’90s, he and Jones themselves remodeled the building that would become Daptone Records, even doing the electrical wiring themselves. The film takes us to North Augusta, South Carolina, where Jones was raised, along with nearby Augusta, Georgia, where Jones tours a museum dedicated to another famous musician from the area, James Brown. And Jones talks about growing up in the South during segregation, remembering how a cruel shopkeeper taught a parrot to say racist slurs anytime a black child entered the store. And there are powerful musical moments in this film. At one point, Kopple literally takes us to church. Jones sings a mighty version of the old hymn “His Eye is on the Sparrow” (best known for versions by Ethel Waters and Mahalia Jackson). Jones is winded by the end of the song, but then again, it also has a breathtaking effect for those of us who are listening. Unfortunately, this song is not on the soundtrack album for the movie. 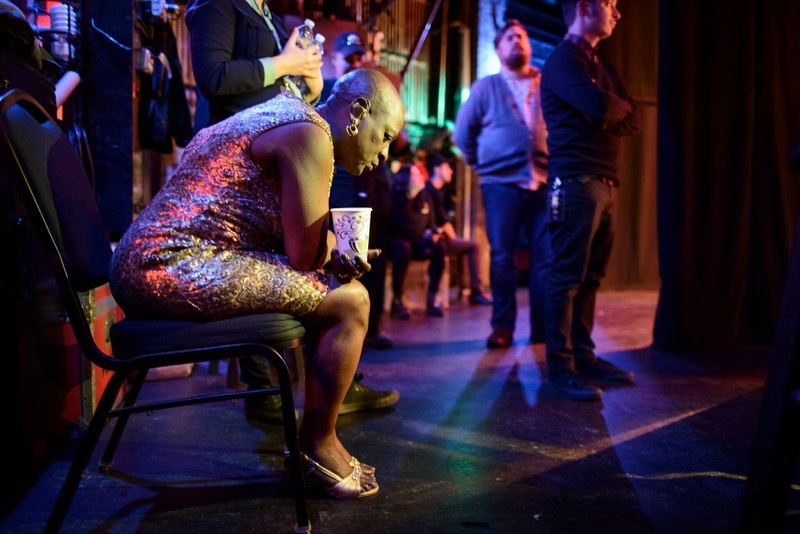 We see Jones backstage at New York’s Beacon Theatre, where she kicked off her comeback tour in February 2014 —a tour that included a sold-out show at the Lensic Performing Arts Center in Santa Fe. As guitarist Griptite goes through his soul-show spiel announcing her entrance, we see Jones’ stage fright poignantly illustrated by her hand shaking uncontrollably as she grips a paper cup. But only seconds later, she walks onstage and transforms into the superheroine her fans know best, visibly soaking up the applause, the cheers, and the love. Spoiler alert: Miss Sharon Jones! has a happy ending, in which Jones is cancer-free and the Dap-Kings are again going strong. However, after the film was made, the cancer returned. Jones had to resume chemo treatments last year. Early last month, she was forced to cancel a European tour. “Sharon is doing well, but must undergo a medical procedure related to her cancer and the recovery time will conflict with these European dates,” her website says. However, it also says that an American tour scheduled to begin this month will go on. Miss Sharon Jones! opens Friday, Sept. 9, at The Screen on the campus of Santa Fe University of Art and Design, 1600 St. Michael’s Drive. Here's a song from Give The People What They Want called "Retreat!" Here's Sharon at South by Southwest in 2010. 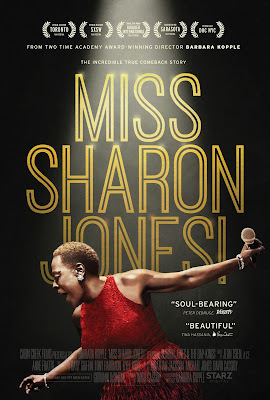 And here is the official Trailer for Miss Sharon Jones!